The advancements in technology are at a high pace, especially in the IT field. Every day we get updates for various software applications and hardware, but these advancements also have raised cyber-crimes. Data has become the most important thing in one’s life. And for the safety of our data, we have to take protective steps from hackers who have malicious intentions. Here comes the requirement for an ethical hacker certification. Forensics, which means a public discussion or debate, is seemingly the least recognized cybersecurity field. Exploring and understanding forensics is fun and at the same time demands a lot of learning, required to make a cybersecurity professional expert in the field. As digital technology is being broadly adopted by criminals across the globe, organizations are facing highly advanced cyber-attacks, and thus, the need for highly skilled cybersecurity professionals has gone up multifarious. How Much Can a Certified Ethical Hacker Earn ? Are you considering a career as an ethical hacker or are you recently qualified with a CEH certification? Perhaps you are considering a career change or looking for a step up the ladder in your security job? Here are some answers to your questions about the many options in your cybersecurity career. A much-asked question: how much do Certified Ethical hackers earn? The short answer, a lot. More than enough to make up for the cost of getting credentialed. What is the CEH Certification? The certified ethical hacker exam supports individuals in the network security discipline of ethical hacking from a vendor-neutral perspective. It shows graduates knowledge of information gathering, carrying out attack exploits, and social engineering techniques. Becoming a respected penetration tester or a certified ethical hacker is an excellent career goal. With the ever-present threat of cybercriminals and fast evolution of attack techniques, many companies have realized one of the best tactics for keeping data secure is testing their systems against the same methods used by hackers and cybercriminals. The actual performance of a penetration test is a highly technical task. It also requires proper, ethical conduct and excellent report writing/communications skills. Many professionals become pentesters on their own, developing hacking skills through self-study and trial and error. While that can take care of the technical skill part of the job, in today’s market, it may not be sufficient to secure a good paying job. A good alternative that will let professionals develop their technical skills, adhere to an ethical code of conduct, and even show they can create meaningful reports is earning an ethical hacker certification. The Certified CISO (CCISO) Program is an elite program designed to produce top-level information security leaders by concentrating on both technical skills and information security management strategies by the executive management’s goals. CCISO arms information security executives with the right weapons to prevent possible cyber-attacks from arising and harming an organization. To become a CISO, one must have the technical knowledge and must incorporate specific skills such as building and maintaining organization’s aims and strategy. The program was developed with the enthusiastic CISO in mind, focusing on the most critical aspects of an information security program. The foundation and outline of the CCISO program comprise three elements—Training, Body of Knowledge, and the CCISO exam—made by a core group of high-level information security executives, the CCISO Advisory Board, exam writers, quality checkers, and trainers. Use this quick start guide to collect all the information about EC-Council CND (312-38) Certification exam. This study guide provides a list of objectives and resources that will help you prepare for items on the 312-38 Certified Network Defender exam. The Sample Questions will help you identify the type and difficulty level of the questions and the Practice Exams will make you familiar with the format and environment of an exam. You should refer this guide carefully before attempting your actual EC-Council CND certification exam. The EC-Council CND certification is mainly targeted to those candidates who want to build their career in Cyber Security domain. The EC-Council Certified Network Defender (CND) exam verifies that the candidate possesses the fundamental knowledge and proven skills in the area of EC-Council CND. We have designed EC-Council CND practice exams to help you prepare for the 312-38 certification exam. This practice exam provides you with an opportunity to become familiar with the question topics and formats found in the actual EC-Council Certified Network Defender (CND) exam. It also helps you identify topics in which you are already well prepared and topics on which you may need further training. We have composed questions for this EC-Council 312-38 practice test by collecting inputs from recently certified candidates and our community users. We have rigorously maintained the topic weights, passing score, exam duration and question format in our mock exam as per the 312-38 Certified Network Defender certification syllabus. Simply, our EC-Council CND practice exam builds readiness and confidence for the 312-38 certification exam. To get familiar with our online practice test platform, we request you to try our sample EC-Council CND certification practice exam. The sample practice test is designed to help you understand the nature of real 312-38 exam environment. 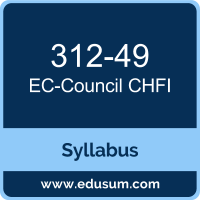 Use this quick start guide to collect all the information about EC-Council CHFI (312-49) Certification exam. This study guide provides a list of objectives and resources that will help you prepare for items on the 312-49 EC-Council Computer Hacking Forensic Investigator exam. The Sample Questions will help you identify the type and difficulty level of the questions and the Practice Exams will make you familiar with the format and environment of an exam. You should refer this guide carefully before attempting your actual EC-Council CHFI v9 certification exam. The EC-Council CHFI certification is mainly targeted to those candidates who want to build their career in Cyber Security domain. The EC-Council Computer Hacking Forensic Investigator (CHFI) exam verifies that the candidate possesses the fundamental knowledge and proven skills in the area of EC-Council CHFI v9. 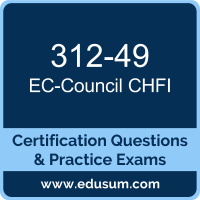 We have designed EC-Council CHFI practice exams to help you prepare for the 312-49 certification exam. This practice exam provides you with an opportunity to become familiar with the question topics and formats found in the actual EC-Council Computer Hacking Forensic Investigator (CHFI) exam. It also helps you identify topics in which you are already well prepared and topics on which you may need further training. We have composed questions for this EC-Council 312-49 practice test by collecting inputs from recently certified candidates and our community users. We have rigorously maintained the topic weights, passing score, exam duration and question format in our mock exam as per the 312-49 EC-Council Computer Hacking Forensic Investigator certification syllabus. Simply, our EC-Council CHFI v9 practice exam builds readiness and confidence for the 312-49 certification exam. To get familiar with our online practice test platform, we request you to try our sample EC-Council CHFI certification practice exam. The sample practice test is designed to help you understand the nature of real 312-49 exam environment.